Total time: 25 minutes, plus rice or pasta cook time. Citrus, soy and spice are everything nice. 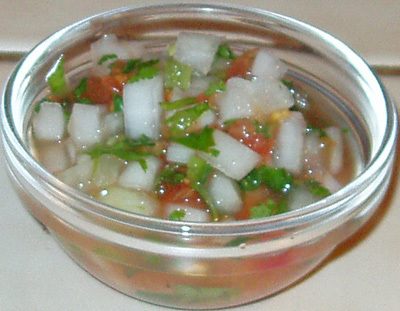 This works well as a marinade or sauce, grilled or stir fried or any way you like. Heat a large frying pan or wok on medium-high to high heat. Add peanut oil, swirl. Stir fry your onions for 3 minutes, then add meat, garlic, ginger, and lime juice. 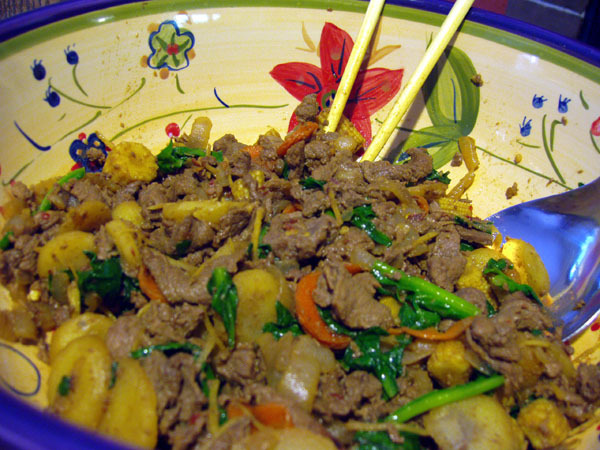 Continue to stir fry until meat is desired doneness (3-7 minutes). Add remaining ingredients and stir fry for 3 more minutes or until vegetables reach desired doneness. Shown here with carrots, sliced water chestnuts, baby corn, and spinach. I like to marinade my meat and onions in the sauce for 4-6 hours before cooking. I use the above method only if I don’t have time to set a marinade. Brown hamburger with onions, then stir in seasoning. Remove from heat. While that’s cooling, mix together your cheeses and 2 T of the heavy cream. In a separate bowl, mix together your eggs and remaining 2 Tbsp heavy cream. 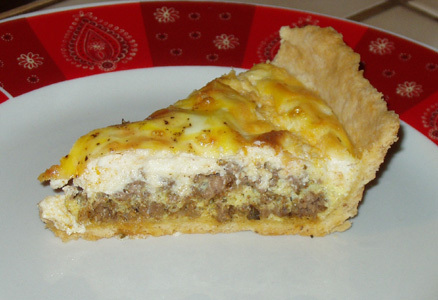 Spread the meat mixture across the bottom of the pie crust. Dollop and then spread the cheese mixture on top of the meat. Pour the eggs and cream evenly across the top of it all. If you read it, you might recognize my seasoning blend from the Un-Sausage Cheesy Meat Wad recipe. It makes the hamburger taste remarkably similar to sausage. You can, of course, replace the meat and seasonings with sausage. For my pie crust, I used half the recipe for Empanada Dough I. It was a perfect fit, and I could pull little pieces off and “reseal” anything that broke. Total time: 10 minutes with a food processor or 30 minutes by hand. If I weren’t so afraid of the food processor, I’d use it. Instead, I peeled my tomatoes and chopped everything really teeny tiny. Your call. A little warmer than I originally thought it was going to be, but perfect for JB. Total time: Approximately 2 hours, plus overnight time to stale bread. This comes to me via my friend Will, whose grandma writes in the notes: New Orleans recipe since that’s where I’m from, don’t judge. In a saucepan slightly beat egg yolks then add the next three ingredients and blend well. Cook over low heat until mixture comes to a boil. Blend cornstarch in water and stir into hot mixture. Continue cooking until thickened. Remove from heat and stir in brandy. Serve when cooked. The first bread pudding dessert I tasted had raisins in it. As with everything raisin, I’m nervous… but I want it…). Total time: 2 hours, plus overnight to stale your bread. Lots of sugar and a hint of brandy, make sure you have lots of time available to do this one. Preheat the oven to 350 degrees Farenheit. Grease a 13 inch by 9 inch by 2 inch pan. Pour bread mixture into prepared pan. sprinkle brown sugar mixture over the top and bake for 35 – 45 minutes or until set. remove from oven. Mix together the granulated sugar, butter, egg, and vanilla in a saucepan over medium heat. stir together until the sugar is melted. add the brandy, stirring well. pour over bread pudding. Server warm or cold. Don’t feel like rolling and cutting? 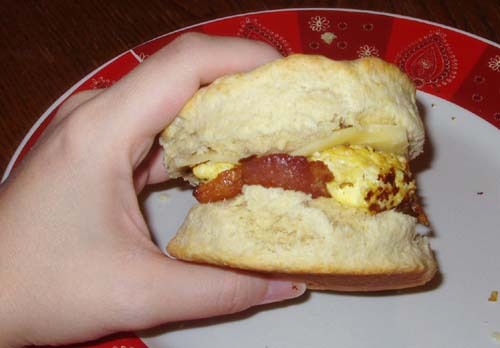 Add 1/4 cup milk and make drop biscuits. Total time: Approximately 50 minutes. It’s imitation bread pudding at its finest. Don’t ever try to pass this off as a real bread pudding, especially to southern grandmas. 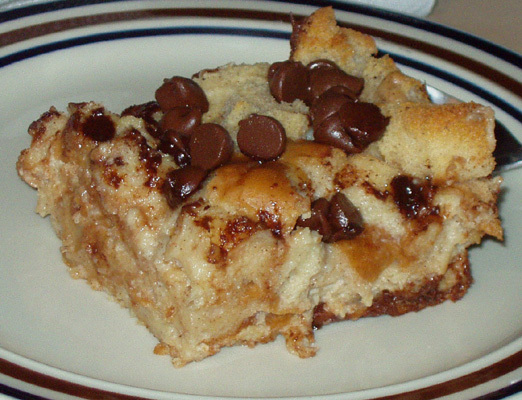 Adapted from Kraft Food & Family’s Rustic Chocolate-Cinnamon Bread Pudding. Slice of warm tasty goodness. 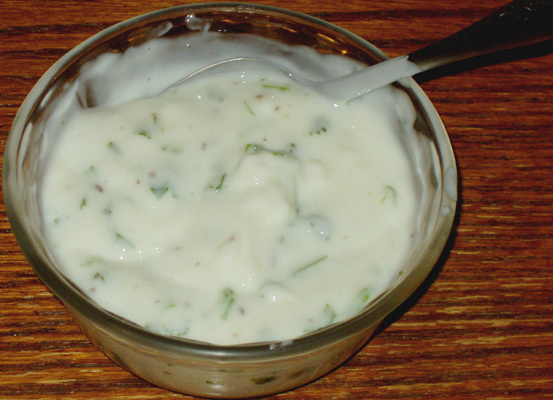 In a large mixing bowl, cream together cheese and sugar until well blended. Add eggs, cinnamon, and nutmeg; mix well. Gradually add milk, stirring constantly and mix well. 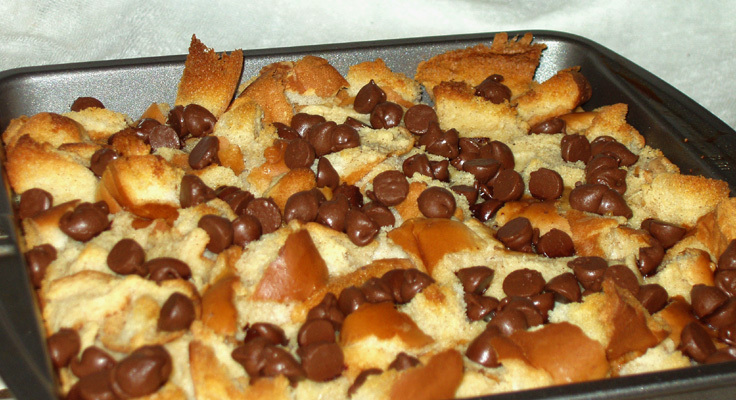 Place bread in 8-inch square baking dish; top with cream cheese mixture and chocolate chips. Bake 30 to 35 min. or until set in center. Cool slightly. For next time, I’m going to layer the chocolate in between half the bread. Something just seemed odd about having the chocolate on top (other than clinging to my spatula while trying to serve). Total time: Approximately 25 minutes. Brown hamburger, garlic, and onions in a large skillet on medium heat. Add soup and milk, stirring constantly. Add cheese and stir until melted. Add broccoli and cook on medium 3-5 minutes or until soup begins to boil. Add rice and stir stir stir. 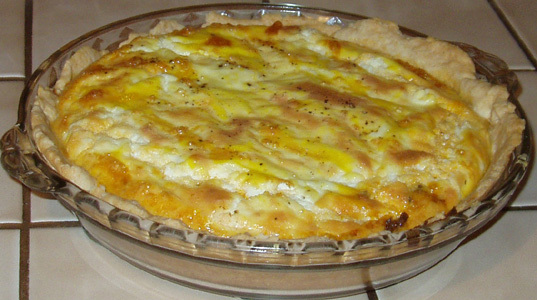 Top with crushed Ritz crackers and cheese before serving. This filled up my frying pan and served three. Hooray for one-dish meals! Try it with any meat or no meat at all. Try it with any vegetable or no vegetables at all. Total time: 10 minutes, plus waffle cook time. Mix together, batter will be and should be somewhat lumpy still. 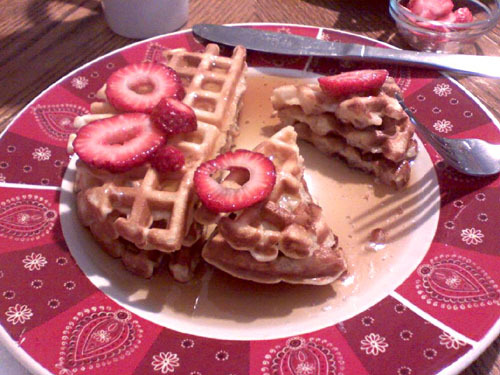 Spoon 1/3 c – 1/2 c of batter onto waffle iron. Makes about six 6-inch waffles.